Last Tuesday morning at about 9:30 I was sitting at my computer looking out towards the woods when lo and behold the flakes began. I leapt up and before I knew it my five-year-old self had appeared. “It’s snowing! It’s snowing!” She hadn’t shown up in a while so it was good to feel that exuberant enthusiasm coursing through me. As everyone knows, what got dubbed “Snowmaggedon” slowed things down significantly in the Deep South, causing no end of trouble and some tragedy. Nobody was ready for the freezing roads that developed in a matter of hours, and when everyone tried to get home at once, the roads were clogged immediately with frustrated and frightened drivers slip-slidin’ away. The nation took notice. From television to radio to social media, everyone outside the South had something to say about how poorly we were coping, and many living here responded defensively. Sociologist and writer John Shelton Reed observes in his essay “The Three Souths,” in his book Minding the South, “Southerners still do many things differently—and they keep inventing new ways to do things differently.” I have no doubt that if the Deep South were regularly to spend more time in the deep freeze, there’d be a lot of adaptation going on. Cooks would come up with bourbon-flavored and Karo-syrup-flavored and for that matter Tabasco-sauce-flavored snow ice cream. Talladega would add an ice-driving event. Practitioners of noodling, the sport of catching catfish by hand, would kick it up a notch by inventing frozen noodling, or froodling. Every red-blooded southern male would lay in a supply of sand to help with the neighborhood roads and invest in a 4 x 4 for rescues, just as they head out with chain saws after tornadoes. And people would look out for each other as they did during the last week, the old-fashioned way, pushing stuck cars while still dressed in office clothes and thin shoes, and the new way, setting up social media alerts for stranded drivers to find places they could get warm and be fed. I posted my fair share of snow pictures and took a little ribbing for it. 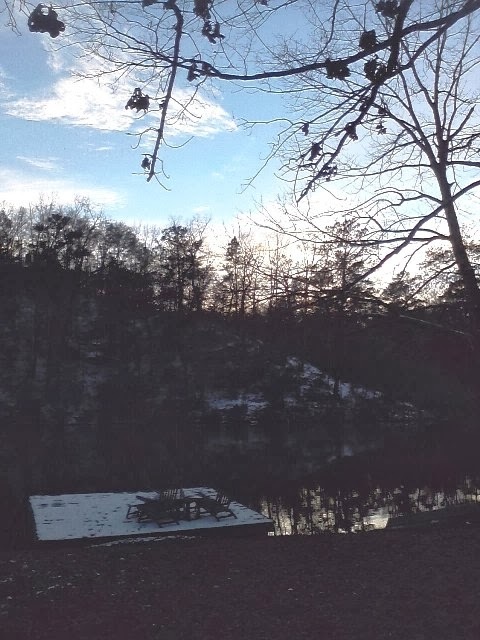 As the sun set on Thursday, most of it had melted, and the dock looked like a postage stamp of white on the brown—but still frozen—lake. The South will ice again, I’m sure; I think the next time we’ll be a little more ready.